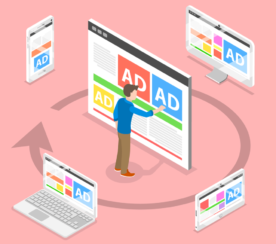 Remarketing lists for search ads (RLSAs) allow Google AdWords users to customize search network campaigns to target users who have completed a desired action on their website. 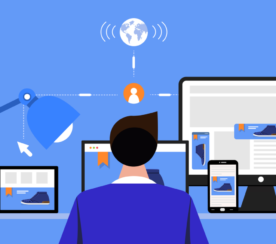 This targeting can allow advertisers to target a specific audience already familiar with the brand, while leveraging budget to maximize ROAS. In this post, I will outline 5 actionable uses of RLSAs that will allow you to influence your search network targeting and modify bid strategies on AdWords based on audience lists that can easily be created within Google Analytics. 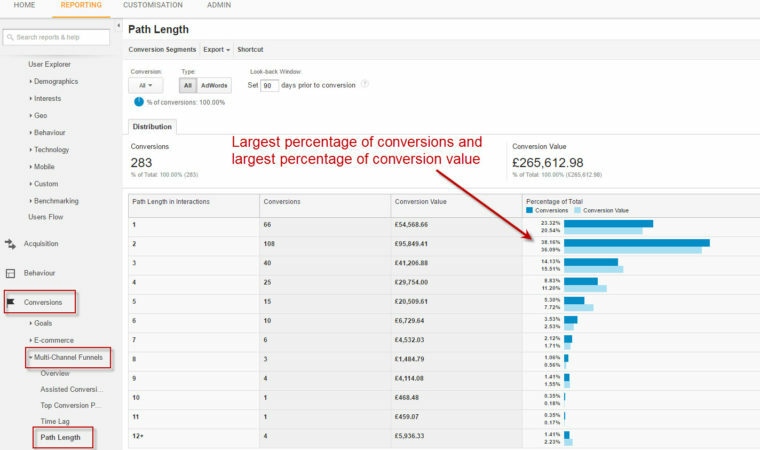 Within Google Analytics, you can view the split of conversions by number of channel interactions. This data is available in the path length report, in which you will be able to view how many conversions and the value of conversions split by the number of sessions the user has had before making a purchase. This data can be extremely useful for modifying bids on Google AdWords. For example, a bathroom retailer might find that their most profitable website visitors visit their site twice before making a purchase. In the example above, you can see that the biggest chunk of revenue is generated from users who visit the site for a second time before proceeding to make a purchase. With this in mind, we could increase bids for users who have visited the site only once previously but not yet made a purchase. I would recommend applying this list using the Bid Only option. Using the Bid Only setting gives you the option to set bid adjustments if the person searching is a member of your RLSA list. You can learn more about this setting here. Every year Black Friday seems to turn regular shoppers into a frenzied mob of bargain hunters. In addition to in-store madness, customers will often purchase online from retailers for the first time on Black Friday because the offers are simply too good to refuse. Using RLSAs, you can increase bids for Black Friday shoppers who made high-value purchases on Black Friday, in an attempt to bring them back to your site for additional purchases in future. For example, consumer electronics retailers such as Currys run huge discounts around Black Friday, so they could increase bids for users who spent more than £350 in a single transaction on Black Friday, when those users are searching for other products they stock later in the year. To create an audience list based on a specific date, you would need to visit the conditions tab in the Analytics audience creator. To target high-value Black Friday customers, you’d enter the session date as the 27th November 2015 (Black Friday last year) and the revenue per session > (more than) the average order value – in this case we have entered a value of £350. Again, I would recommend applying this list to existing ad groups using the bid only option in AdWords. This will allow you to increase your bids whenever high-value Black Friday customers are searching for keywords included within those ad groups. 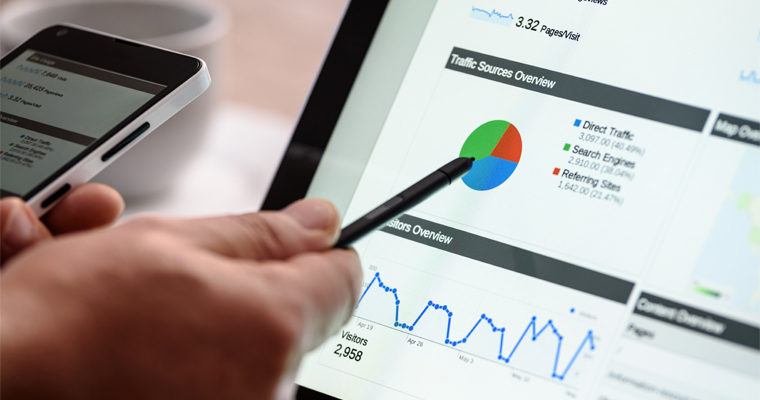 This is one list that I’ve found particularly useful for clients who have set up micro conversions in Google Analytics. Micro conversions are classed as activities that website visitors engage in before making a purchase. For example, activities such as signing up for an email newsletter, creating an account or downloading a PDF would all be classed as micro conversions. This tactic will allow you to increase bids for users that have already completed a micro goal on your website whenever they are searching for keywords that you’re targeting. For example, Mercedes could increase their bids for users that have previously interacted with their finance calculator (micro goal), but not yet completed a contact form to request an appointment at the dealership (macro goal). Again, I would suggest applying this to existing ad groups as a bid only strategy in Google AdWords. This remarketing list will allow you to adjust bids for users that have generated a high conversion value for you historically and could help you avoid losing customers to your paid competitors. For example, online grocery retailers could identify shoppers who spend more than their average order value on their monthly or weekly shop. They could utilize RLSAs to increase bids for users searching for generic terms such as ‘buy groceries online’ or set up a campaign to target and bid on competitor terms whenever users within the list are searching. This tactic can be particularly effective in industries where consumers aren’t very loyal and often flick between different retailers due to convenience, as you can boost visibility whenever high-value customers are searching for competitors. 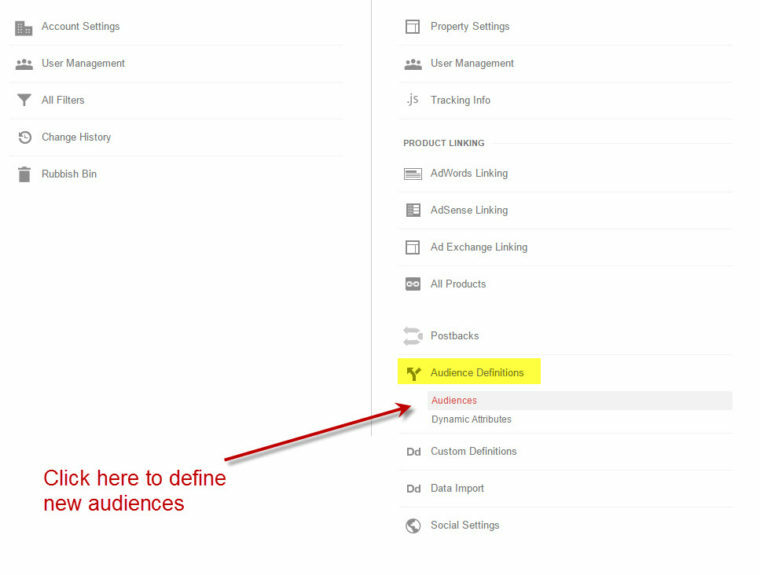 You can create this list in the Enhanced E-commerce section within the Google Analytics audience builder. You could apply this list to existing ad groups as Bid Only to increase your bids whenever these users are searching for generic terms. 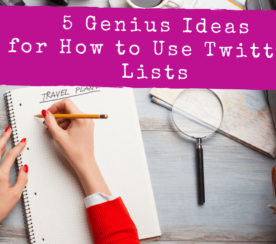 Also, you could create a campaign containing competitor brand names and apply this list as Target and Bid, so your ads would only be triggered if the user searching for your competitors has previously visited your site and made a high-value purchase. Google Customer Match lets advertisers upload and target email lists via AdWords. Using customer match, you can upload email addresses to AdWords via the Audiences tab. Google will then match these email addresses with any Google accounts that share the same email address. Like all remarketing lists, you will need to have a minimum of 1,000 list members for your list to be eligible for use on Google search. This figure relates to the number of email addresses in the uploaded list that are registered for a Google account. So to be eligible for targeting in Google AdWords, at least 1000 of the email addresses you upload must match an email address registered for a Google account. A few of my clients utilize customer match to advertise loyalty programs for their existing customers, when previously the only way of communicating these schemes was via email, direct mail or telephone. For example, if you’re running a discount for all customers who have registered for an account, you could advertise this discount on your search network ads by setting up an ad group referencing the discounts and adding your email list using the ‘target and bid’ option so that they will get visibility of your discounts when searching Google. RLSAs offer a wealth of potential targeting opportunities and can help get the most out of even the smallest of advertising budgets. So, if you’re not already using remarketing lists to customize your search network targeting, I strongly recommend giving a few of these tactics a try. Have you already used RLSAs? If so, please comment below to share your tips and tactics.